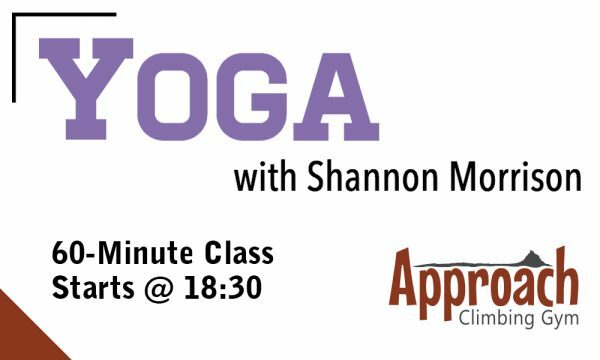 Come join us for Yoga Tuesdays & Thursdays with Shannon Morrison. FREE for Members! Admission for non-members is included with the cost of a Day Pass. This is a 60-minute yoga flow tailored for climbers. This class will help open up your chest and shoulders, strengthen your core, and aid in hip flexibility. Everyone who enters the gym (climbers and observers) must have a signed Visitor Agreement on file. There are no exceptions to this rule. All users 18 years of age and under must have a parental consent on file prior to accessing the facility. The legal guardian will be called if not present during the minor's first visit. Parents must fill out a separate waiver for themselves in addition to their children. Please note this document requires electronic signature consent and email verification of user.